...like weight pulling!! Stony was a natural at weight pulling, earning his WWPD title easily. Stony also earned his WTD title, traveling many miles in front of a sled in winter and a rig in spring and fall. He put in some mileage on the hiking trails as well! Stony LOVED Rally obedience! He earned his Rally Novice title quickly, placing in the top three each time. 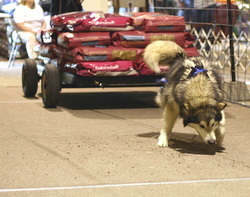 I believe Stony was the SECOND malamute in the country to earn an AKC Rally title! He earned his Rally Advanced title, in three straight tries, with very high scores; completing the title ON the very day of his 11th birthday! Stony completed both his NAP and NJP titles in agility at the age of 9! He earned the NJP title in three straight trials with 2 CLEAN RUNS and all top placements! The NAP he earned with another two CLEAN RUNS, and more top placements! 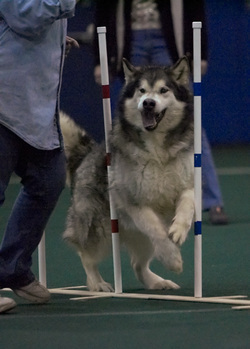 He had taken a 5-year break from agility, and went back to competition with glee! He even earned a Front & Finish Award of Excellence! 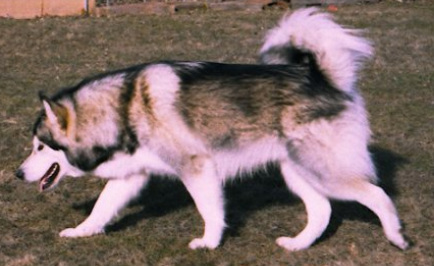 Stony was my "right-hand" dog, and always the one I tried new things with first, because of his calm and level-headed approach to any activity we did. He was a GREAT dog- even though he was often such a "bad" dog...full of a sly humor, and as good a sneak thief as ever there was- you never turned your back on any sort of food with this dog around!! Stony was also a first-rate "puppy-sitter", and gently "helped" to raise several puppies, including Rhodesian Ridgebacks, American Staffordshires, and Malamutes!